On Christmas Eve, the trustees of Gramercy Park and the Gramercy Park Block Association hosted an evening of caroling, an annual tradition that draws thousands from around the city to the normally private park. The event was hosted by Arlene Harrison, president of the GPBA; Calvary Rector Rev. Jacob Smith and Rector Emeritus Rev. Dr. Thomas Pike. Caroling was led Kamel Boutros, music director at Calvary-St. George’s, with music by Alex Nguyen and Friends. The 13th Precinct Community Council held its annual holiday dinner for members at Hane Sushi in Stuyvesant Town on Monday evening. About 30 regular attendees of the monthly community council meetings were at the dinner, including the precinct’s commanding officer, Deputy Inspector Steven Hellman, Executive Officer Ernesto Castro and community affairs officers John Considine and Detective Vincent Arlotta. Community Council President Frank Scala thanked the officers for their work in the community throughout the year and Hellman said that he was looking forward to continuing the work in the neighborhood next year. Readers of Town & Village have once again made the holidays a little brighter for children stuck in hospital rooms as well as well as other children in need by donating 406 toys to this newspaper’s annual drive. 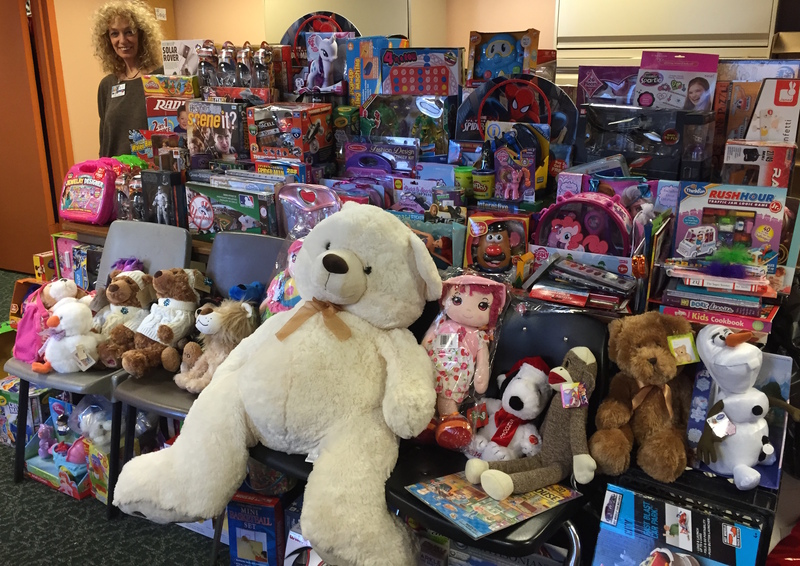 The toys will be distributed throughout the pediatric department of Mount Sinai Beth Israel, where some young patients are awaiting surgery, as well as to the children of patients who utilize the hospital’s network of opioid treatment centers. The vast majority of the patients are low-income. Rolf’s, a German/Bavarian restaurant in Gramercy, has been known for years for its stunning display of antique dolls complemented with rows and rows of Christmas ornaments and lights strewn throughout the space during the holiday season. But few know the history behind the tradition, which began 35 years ago and has since made the venue world-famous. It was in 1981 when the original owner of the restaurant, Rolf Hoffman, died due to lung cancer at the age of 49. Robert Maisano, who now owns the place, knew Hoffman and recalled how he very much wanted to keep the place a German restaurant, serving up heaping plates of schnitzel, sausages and potato pancakes. Maisano hasn’t strayed from this mission, though the emphasis on transforming Rolf’s into a winter wonderland each year is his own. Guests enjoyed free cookies and hot chocolate and cider and also picked up free necklaces and stuffed reindeer toys. Children got to take pictures on Santa’s lap nearby in the Oval Studio. A Menorah lighting will take place on December 28. The Union Square Holiday Market, which, every year, takes over the south end of Union Square Park for the five weeks leading up to Christmas, has now been around for over two decades. But UrbanSpace, the company behind the long-running event, has made some changes this year, including putting in two stages for performances, an area for children’s activities, and a new section called Urban Provisions for packaged food items. There’s also been an expansion to a recently introduced section called Little Brooklyn, with many additional booths run by craftspeople and merchants from that borough. Aesthetic changes include more lighting and tree branches fashioned into archways and logs placed here and there to give the market a more woodsy feel. Taking a T&V reporter on a stroll through the market earlier this week to explore some of the new additions was Mick Joseph. Joseph, a resident of Stuyvesant Town, is a market veteran, having operated a booth for DezignMind, the company she runs with husband Claus Ronnex-Printz for the past 14 years. For that company, the couple works with families in different countries, in particular Bali and Thailand, to produce items Joseph designs, from wooden percussion animals that make surprisingly accurate noises when brushed with a baton or used as a whistle to fragrant clove boxes and ornaments to decorative masks.